In July 2016, Georgie Lambert contacted DogFit to find out more about canicross. Having never tried the sport before, she wanted to book a DogFit training session with her rescue collie, Benson and also get to get the correct kit to start canicrossing. Fast forward two years and the pair were competing at the Canicross World Championships in Poland! We finally caught up with George and Benson, who are fresh back from qualifying for the 2019 Championships in Belgium. What a success story! What made you sign up to your first canicross class? “When I first brought Ben home, he was a nightmare when it came to recall. He was also rather overweight and I knew that he needed more exercise to stay healthy. I have always enjoyed running and had heard about canicross, but I didn’t really understand what was involved, or that it was a sport that lots of people did. So, I booked us into a DogFit Canicross class to find out more about it. So how did you get into the competing side? What do your fellow racers make of Benson? You have recently acquired another dog that you are hoping to train up for canicross as well. Tell us about her. So, what’s next for you and canicross? “Ben and I have just qualified for the world championships once again, and we will be off to Belgium to compete in the finals later in the year. In the meantime, we are also going to enter a few ‘maverick’ races, or local trail-based runs to keep up the training in a more relaxed way. Ben likes these kind of races as you can start off at timed intervals – he can find masses starts a bit intimidating with all the crowds that are there. What advice would you give anyone hoping to follow in your canicross footsteps? 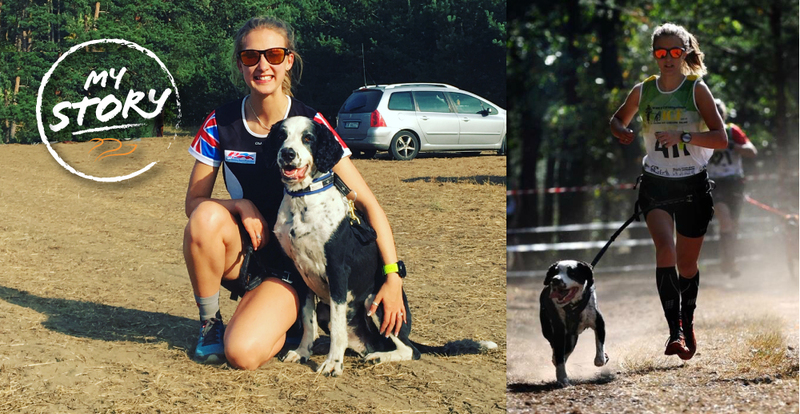 DogFit are super proud of what Georgie and Benson have achieved and continue to support them in the future competing careers. As a company, we celebrate everyone that participates in the sport, whether you are jogging 1K or competing at World Championships! If you would like to know more about this fabulous sport and how to start – please do get in touch. When your older dog can’t run anymore – borrow another!